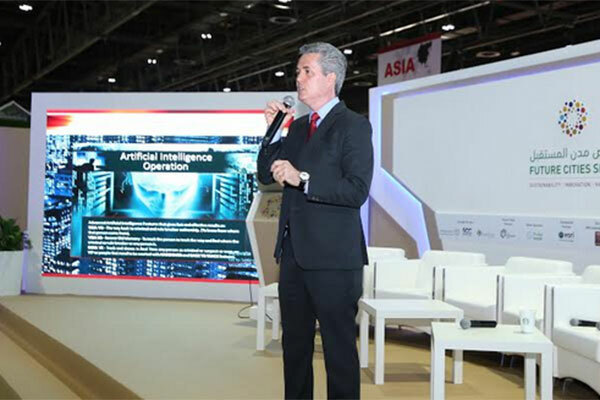 Brazil-based Polsec, a top security organisation, presented futuristic artificial intelligence (AI) camera and sensor technology that sees, smells and listens for potential problems at the Future Cities Show in Dubai on April 10. The advanced and adaptable technology of Polsec, which is already operating in some Brazilian locations and is currently being tested by India in Mumbai, Delhi and Agra, uses tiny microsensor units placed throughout public areas. Polsec’s bio-behaviour metrics can identify and track even fully-covered people by the way they walk and can also be used to identify unusual human behaviour. For example, the movement sensors can perform tasks such as learning how many people cross a street every day at a particular hour in order to then detect and report if this figure suddenly surges. It can also be used to detect and report unusual traffic situations and even parking violations. The ‘bionic-ear’ voice recognition facility can be programmed to listen for specific words, such as ‘help’ or ‘police’ and send an immediate report. In addition, the sensors can listen for and pinpoint an individual’s voice and are capable of searching for the attributes of any unknown person, such as gender, ethnicity and even accents and dialects. The ‘smell’ sensors have a variety of uses, such as the ability to effectively monitor the air for pollution or other potentially dangerous environmental factors over a wide area. Polsec’s Iris 360-degree lens can even blink to clean dust from the lens, which is particularly useful in desert conditions. In environmental terms, the ‘digital eyes’ can also be used to capture the presence of people and increase or reduce the brightness according to necessity, saving electricity and bulb lifetime. “Synonymous globally with being a trailblazing city in many engineering and technological fields, this is a chance for the Dubai to ensure no crimes go unpunished and it can easily claim to be the smartest safe city, even as it continues to expand and its population increases. “Surveillance is a major investment by cities, when you consider spending on the technologies that enable Smart City initiatives is forecast to reach US$1.26 billion for the Middle East and Africa region in 2018, according to recent insights from International Data Corporation. In addition, IDC’s Worldwide Semi-annual Smart Cities Spending Guide predicts fixed surveillance as being one of the region’s most significant areas in terms of spending,” he said. Werner claimed Dubai has the opportunity to be the first to boast a zero crime rate, either in key areas, such as airports and the metro network, or throughout the entire city through installation of a comprehensive sensors network and a centralised control room, with fixed communication channels to the police.